Sliding menu is now became the one of the most common feature in a mobile application. This menu is hidden and can be shown by swiping the screen from left to right or tapping the icon on action bar,and in the same way hides on swipe from right to left or tap any where on the screen. Listview is used to bind the menu items and Textview to show expandable description window in the bottom of the screen. Here Listview is placed below in the layout file for the higher the z-index value. 4. Write the class for gesture listening. Here Left to right swipe area is restricted to 100 unit from the left[if(e1.GetX()<100) ]. 5. Declare and Initialize the GestureListener and UI controls. Here also Sliding menu width is restricted to 3/4 of the full screen width. 7. Write down the action for above defined gesture events. Here boolean flag "isSingleTapFired" is declared to avoid the conflict between gesture event "SingleTap()" and menu click event "menuIconImageView.Click()" i.e. Conflict is when you click on title bar menuIcon to expand the menu, in the other side gesture event SingleTap() also get fires. 8. At last but important one is sliding the menu. Animate the menu from left to right and right to left using TranslateAnimation function. For the movement along x-axis specify start,end point and keep y-axis start,end point as zero. Even though it takes too much to scroll down[;(] it is simple concept. need to more focus on the animation function and the gesture listener and rest is regular coding. Thanks for your time here,Visit again. I will come back with new and exciting topic on mobile application development. How can we shift menu to right and swipe from right to left? Hi Suchith Madavu, Great it works well. But one issue I am facing. I have implemented this for my filter layer. On starting of application my filter layer will be hidden. On click of filter button in tablet this layer has to show with animation on close button click filter layer will hide with animation. Very first time when I click the filter button filter layer shows up without animation. Next time onward animation works fine. Do you have any idea why this happen? 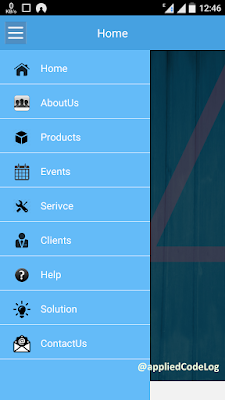 Hello Ranjith, you can check this http://www.appliedcodelog.com/2016/01/navigation-drawer-using-material-design.html navigation drawer using android material design. This will solve the non animation for the very first time movement. Thanks arvind. Glad that it could helped you. Suchith can you tell me how to add theme in this example? like in your output coming in my output black screen coming(with proper output) there is no theme but in your screen one theme is there. Here didn't used any theme. Changes in the output screen is because of the device internal theme. But I want to ask how to open or call a new page when any item pressed..
which event do that please? FnMenuSelected() inside an activity class gets fired according to the action event "actionMenuSelected" from adapter class. where you can think of adding new screen. how to add scroll to screen have contain this menu? Sorry I didn't get you. Menu has been added to list view,so how you get scrolling issue there.